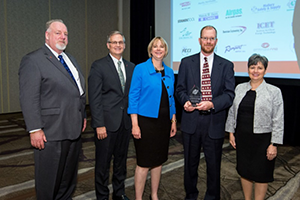 PNNL’s Reid Peterson, Vit Plant support program manager, and Loni Peurrung, receiving the award from BNI Manager of Procurement Jim Willman, President Barbara Rusinko, and Manager of Engineering Russell Daniel. PNNL has supported BNI on the Vit Plant project since 2001, helping to resolve the technical challenges and safety concerns presented by this complex, first-of-its-kind undertaking, and has lead or participated in research into nearly every area of plant operations. 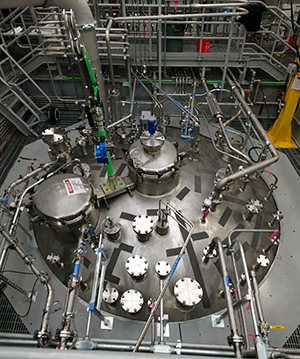 Among the many challenges the Vit Plant project faces is the waste itself—a complex chemical soup of radioactive liquids and solids that have been stored for decades in aging underground tanks at Hanford. PNNL researchers have worked closely with BNI to understand the chemical makeup of the waste and how it will behave when processed at the Vit Plant—from the time it leaves the tanks to when it’s in its final glass form—helping to ensure the plant will process the waste safely and efficiently. PNNL researchers have had key roles in planning, executing, and reporting on tests using full-size prototypes of plant vessels and simulated wastes to ensure that waste slurries can properly mix with chemical additions and be removed from the vessel as part of the waste pretreatment process. An overhead view of the 16-foot-diameter by 35-foot-tall Standard High Solids Vessel Design shows the platform, the pneumatic pulse jet mixer air link lines, and the installed test instrumentation. A key to the successful 16-year collaboration with BNI has been having PNNL staff located at BNI’s offices near the PNNL campus, working side-by-side with their staff, according to Reid Peterson, manager of PNNL’s Vit Plant support program. The Lab was evaluated on overall performance; the ability to deliver quality services or supplies on time; the ability to work collaboratively to meet milestones; and meeting or exceeding project expectations in aspects of safety, construction performance, technical expertise, and environmental compliance. The award was accepted by Reid Peterson and Loni Peurrung at Bechtel’s May Supply Chain Recognition Luncheon. PNNL Research Team: Judith Bamberger, Eric Berglin, Jagan Bontha, Carolyn Burns, Chrissy Charron, Scott Cooley, Richard Daniel, Cal Delegard, Jeanette Doty, Carl Enderlin, Paul Eslinger, Sandra Fiskum, Julia Flaherty, Matt Fountain, Phil Gauglitz, John Geeting, Gary Josephson, Diana Linn, Lenna Mahoney, Kirsten Meier, Michael Minette, Eugene Morrey, Leonard Pease, David Peeler, MS Pekour, Veronica Perez, Reid Peterson, Loni Peurrung, Kurtis Recknagle, Philip Schonewill, Margaret Smoot, Sarah Suffield, Beric Wells, and Satoru Thomas Yokuda.